A luscious adaptation of the Thomas Hardy romantic classic, Far From The Madding Crowd looks dreamy but is constrained by the frustrations inherent in the story. 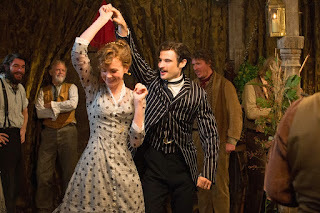 In rural Britain of the 1870s, Bathsheba Everdene (Carey Mulligan) is a humble, strong-willed and unmarried young woman. Next-door sheep farmer Gabriel Oak (Matthias Schoenaerts) sets his eyes on Bathsheba and eventually proposes, but she turns him down, unwilling to become a man's property. Gabriel hits hard times and loses everything; Bathsheba unexpectedly inherits an estate and becomes a respected land owner. She hires Gabriel to tend to her sheep, he continues to care deeply for her from afar, but their relationship remains tense. Two more suitors come forward to try and win Bathsheba's heart. William Boldwood (Michael Sheen) is a very wealthy but aging and lonely estate owner. Sergeant Frank Troy (Tom Sturridge) is a dashing soldier who lost his true love Fanny (Juno Temple) due to a wedding-day misunderstanding. Bathsheba finally makes her choice and marries a man, setting off a series of unexpected events. Directed by Thomas Vinterberg, Far From The Madding Crowd is a pleasure for the eye. Plenty of outdoor scenes bring the British countryside to life, and Vinterberg and cinematographer Charlotte Bruus Christensen use the magic hour to capture an idyllic landscape filled with lush greens and yellows, long shadows and beautiful skies. The music score by Craig Armstrong adds to the pensive mood. The artistry is appreciated, because the story belongs in another century and carries suspect appeal. While Bathsheba is a fictional heroine ahead of her time, Hardy's story is bogged down in her love life, and for two hours the story starts and stops with Bathsheba agonizing over men. This smart and independent woman also suddenly displays atrocious instincts to pick the very worst of three possible choices, pushing deep into incredulous melodrama territory and prolonging the resolution. The sturdy performances help to maintain interest. Carey Mulligan does the best she can with the central role, not necessarily giving Bathsheba new depth but displaying a convincing version of early prototype feminism. Matthias Schoenaerts looks as good as the scenery, although he does slip into mopey mode. Michael Sheen and Tom Sturridge stick closely to their characters' basic definitions of the lonely love struck rich man and conniving soldier respectively. In Far From The Madding Crowd Bathsheba's judgment may be patchy, but at least the visuals are consistently absorbing.